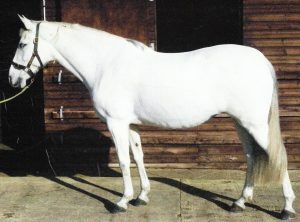 Founded in 1982 this Studbook was opened to cater for British Breeders who wished to capture the exceptionally excellent qualities and characteristics of the extremely rare Purebred Spanish Horse (PRE) in their breeding programmes whilst adding attributes from other breeds that would make the resulting products more suitable to the demands of British riders and competitors. 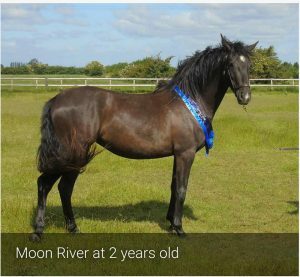 This has resulted in a very adaptable breed which is able to stay popular because breeders are able to adjust the balance of attributes in the PRE Fusion Horses in order to keep up with the ever changing market pressures of the equine industry and hobby. 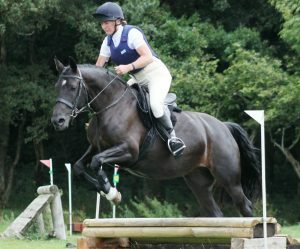 The PRE Fusion Horse Studbook now features many 4th, 5th and 6th generation PRE Fusion horses that excel in a wide range of highly competitive sports, the result of many years of dedicated breeding within the UK. 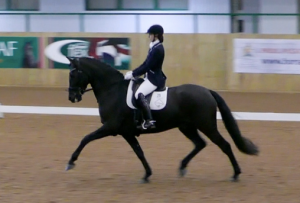 Below Left & Right: Beeches Alberto, 4th Generation British-bred PRE Fusion Horse gelding, winning the Midway Medium Music Championship at Hartpury College, August 2017. 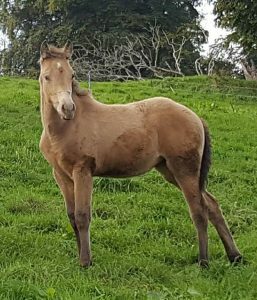 Bred by Claire Quinney out of her Endurance competition mare, ‘Mariessa’, from Sue Disney’s Willowdell Stud mare line, and sired by Magno VI (PRE). 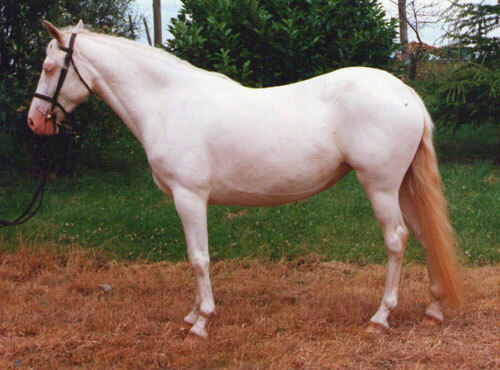 Above: Canna, a good example of the desired PRE Fusion Horse type, conformation and presence. 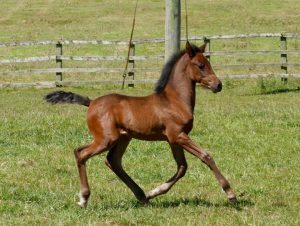 By Kan VIII (PRE) ex Erka (Belgian Warmblood). 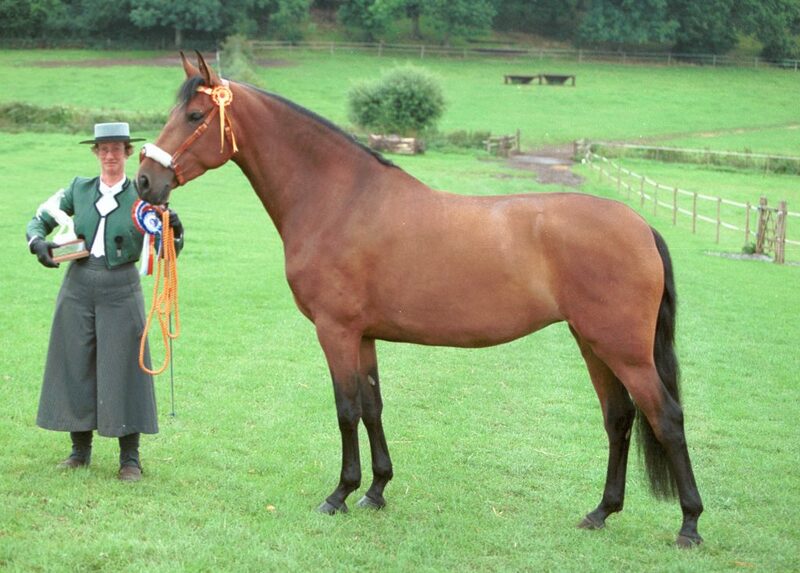 Champion Register II Mare 2001 BAPSH National Show. Bred by Yeguada Iberica, shown by Kim Warren. The PRE Fusion horse features intelligence, excellent work ethic and trainability, a kind and affectionate character, adaptability to new situations, courage and athleticism, a forgiving nature, hardiness with a good constitution, harmonious body proportions with an arched high-set neck proudly carried, strong tendons, very hard hooves, and luxuriant mane and tail; the breed gives an overall impression of quality and nobility. Below: Two lovely youngsters who also demonstrate good PRE Fusion Horse type, conformation and presence. Left: Mistrals Moon River, 2yrs old, by Rocky L Claudius(PRE) ex Roundhills Moon Jewel (Saddlebred x Arab/TB). Bred by Helena Berrisford. Owned by Sarah Berrisford. Right: Aztec Silverio, 4yrs old, by Espiritu (PRE Fusion) ex Aelis (Andalusian/Comtois).Bred by Karen Collison. Owned by Catherine Legg. Head – Size and substance and length of head will vary according to the breeds blended into the individual PRE Fusion Horse but the head should show the Spanish elegance of sculptured nasal bone and fine inverted comma-shape nostrils viewed from the front with a long, fine, mobile top-lip. Large expressive triangular-shape brown eyes. Ears medium size, mobile and well attached. Neck and Body – long graceful arched neck, inserted high and clean into well defined withers and long sloping shoulders (45 to 60degrees) that blend smoothly into a short back. Broad strong loins connect smoothly into rounded muscular hindquarters. 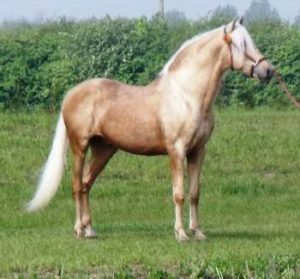 A medium to low-set tail is usual for a PRE Fusion Horse except when there is a large proportion of Arab blood in the immediate ancestry which will result in a higher tail-set. Frontlimbs – Good length of upper-arm sloping back to elbows positioned below the withers. Well muscled fore-arm. Well developed symmetrical joints correctly aligned from side and front view. Medium length cannon bones with well defined tendons. Strong pasterns sloping at about 45 degrees. Hard tough deep round hooves . Hindlimbs – powerful well developed musculature on thigh and second thigh. Well developed symmetrical joints correctly aligned from side and rear view. Hock joint strong and well-defined with a robust achilles tendon attachment. Medium length cannon bones with well defined tendons. Strong pasterns sloping at about 45 degrees. Hard tough deep round hooves. 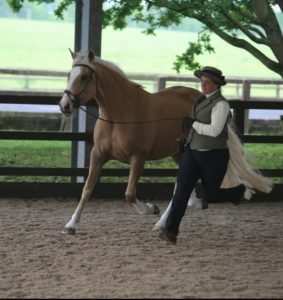 Movement – active, elastic, powerful, harmonious, showing good joint flexion and a willingness to engage the hindquarters. 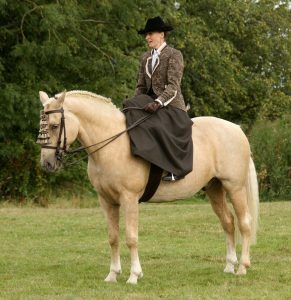 Height – varies from around 14.0hh to over 18.0hh. Colour – Any colour or colour combination is accepted in the Main Studbook. 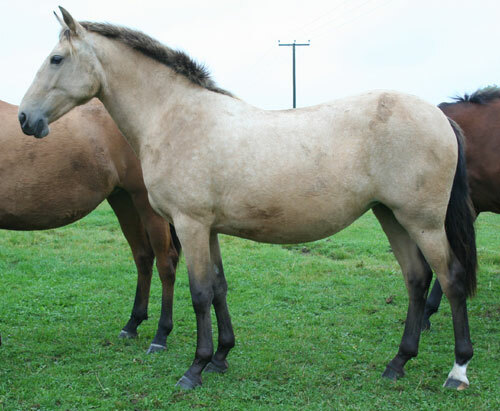 Below are some of the more unusual colours found in the PRE Fusion Horses registered with BAPSH Ltd.
Click Through here to see a list of recommended breeds to use for 1st generation PRE Fusion Horses or to add in later in your breeding programme. Also see Photographic Examples of various 1st Generation horses. Above Lt to Rt: Light & dark Palomino, Black, Silver Bay (Bay + Silver), Silver Dapple (Black + Silver), they are 3 filly foals – Mistrals Praerie Flame , Mistrals Athena, & Mistrals Vega Astraea, yearling filly Mistrals Silver Moon , & 2yr filly Mistrals Montana Rocosa. All bred by Helena Berrisford, Mistrals Stud. 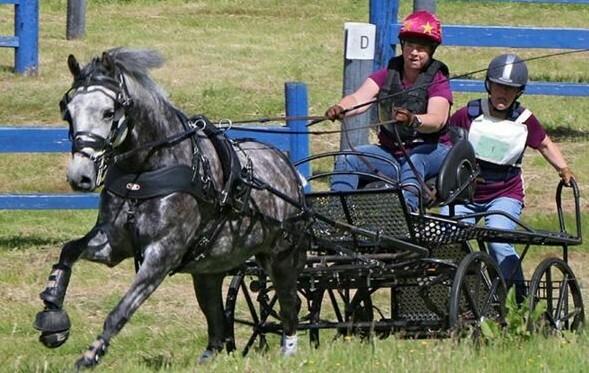 The aim of this breeding program, established in 1982, is to maintain an adaptable and flexible breed with a minimum of 25% PRE ancestry but preferably with 50% to 75% PRE ancestry which is fused with desired attributes from other breeds that make the resulting products more suitable to the current and ever changing demands of British riders and competitors. Breeders of PRE Fusion Horses should ensure that their products retain the proud bearing, innate beauty and charisma of the PRE, and also demonstrate the physical hardiness, strong constitution, and tough legs and hooves that are a trademark of the PRE Purebred. Another important facet of the PRE Fusion Horse is their intelligent, highly co-operative and very easily trainable nature which is inherited from their PRE ancestry. It is strongly recommended that owners of PRE Fusion Horses without the above characteristics do NOT breed from them. Below: Four lovely mares and a filly, who are four direct generations of PRE Fusion breeding at Mandy Wheatcroft’s Mill Park Andalusian Stud. From Left to Right: Mill Danzadora – 50% PRE by Euclides (PRE) ex TB mare; Mill Pequenez – 75% PRE by Diamante XXVI (PRE); Mill Ilustre – 82.5% PRE by Mill Gravitar (PRE); and centre below, Mill Balistica at 5mths – 91.25% PRE by Kilate VI (PRE). i) a Minimum of 25% Apto PRE blood, without unapproved PREs in the direct line between the foal and the PRE Apto ancestor. iii) PRE parents must be Approved for Breeding; any Register II Studbook Stallion must be Approved for Breeding. ii) the Foal must be 5 months old or less when the Registration application form is completed by the Vet. APHA, Appaloosa, or Friesian lineage then that parent or parents must be certified PSSM negative. If the parent/s are not certified negative the foal must be tested for PSSM. 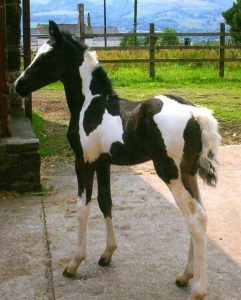 d) a Foal with Friesian bloodlines does not have the recessive genes for Hydrocephalus and/or Dwarfism. If the Friesian or Warlander lineage parent/s is/are certified Negative for Hydrocephalus and Dwarfism then the foal does not need to be tested. b) Blue Eyes which are not as a result of a Dilution gene. c) One or more White Leg markings that extend over most of the knee or hock joint. 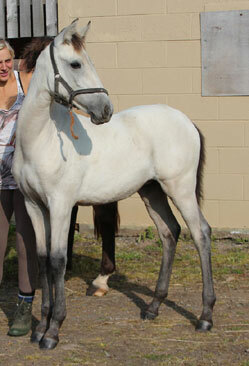 Above: Purebred PRE Filly with White markings that now prevent her registration as a PRE horse in the ANCCE-LGPRE. Imported horses which are registered with a foreign studbook and which are certified to be a minimum of 25% Apto PRE blood via one or both parents leading to a direct connection with Apto PRE ancestry (without an un-approved PRE as an immediate ancestor in the bloodline leading to the Apto PRE) will be accepted into the BAPSH Ltd PRE Fusion Horse Main Studbook when their Registration application with BAPSH Ltd is completed. Imported horses which have the distinct conformation and type of the PRE horse or PRE Fusion Horse demonstrated via 4 photos taken at the time of the Vet Identification for Registration, but have Un-certified Parentage or Unknown Parentage, are accepted and registered in the BAPSH Ltd PRE Fusion Horse Studbook Appendix A or B when their Registration application with BAPSH Ltd is completed. These Horses are now regarded as as Purebreed PRE Fusion Horses, and Register II Section 1 Appendix A & B replace the old Register IV Studbook. See details of these Appendices in their Section further down the page. NOTE: If the horse has an ID-Only Passport (considered by EU to be a Meat-production Passport) it is essential under the new EU Zootechnic legislation that the ID-Only Passport is cancelled via BAPSH Ltd at the time of the Import Registration application and is replaced by a BAPSH Studbook Registered Horse Passport at the time of registration which converts the horse to ‘Purebreed’ status even when the back history is not known. APPLICATION FORM for BAPSH Ltd RE-ISSUE PASSPORTto Upgrade Horse to PEDIGREE REGISTERED STATUS. Equines of another Purebred breed cannot be admitted directly into the PRE Fusion Studbook. because the PRE Fusion Horse is a Purebreed based upon the foundation of Approved for Breeding PRE blood ranging from 25% PRE to 99% PRE. 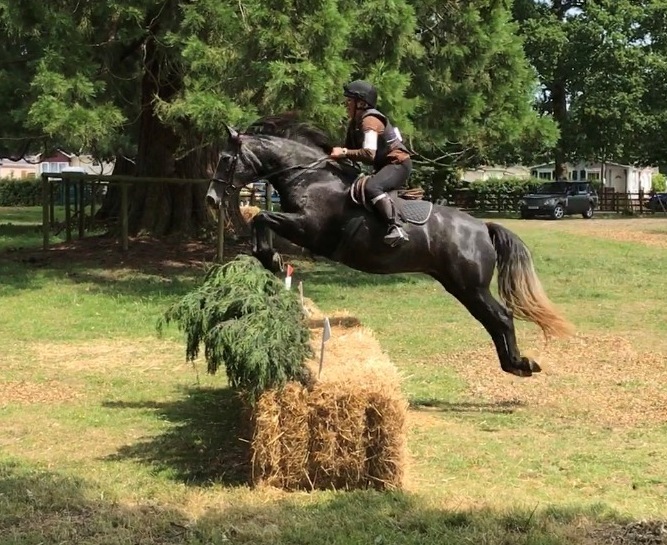 Breeders may continue to introduce new blood into their breeding program via first-cross products between Approved for Breeding PRE Stallions/Mares and any purebred registered equine of another breed that in their opinion will assist them to achieve their own goals. Providing the essential minimum 25% PRE blood is maintained the progeny of the introduced other breed will be registered in the Main PRE Fusion Studbook. Progeny of non-pedigree mares sired by Approved PRE stallions are registered into the Appendix-A of this Studbook. Appendix-A mares should be bred to an Approved PRE stallion to result in the second generation (75% Pedigree PRE) upgrading to the Main PRE Fusion Studbook . 4.The sire or dam is a horse of Unknown pedigree, but the other parent is a registered horse with a certified minimum of 50% Apto PRE blood. Section 1 – Appendix-B (Previously known as Register IV) Horses which comply with the breed characteristics laid down in the breeding programme of the PRE Fusion Horse but do not comply with parentage criteria – EU 2016/1012 ANNEX II, Chapter II Part 2a. 1.There is No Covering Certificate to certify the Sire and the Dam does not have 50% PRE Apto blood. 2.The sire and dam are Unproven. Dealers may give clients parentage information for a purchased horse that has no documentary proof. The horse will be accepted for registration in Appendix-B providing the horse meets the PRE Fusion Horse characteristics, showing PRE-Type or Partbred PRE-Type in the 4 photographs taken at the time of the veterinary ID for Registration. 3.The sire and dam are Unknown. The horse will be accepted for registration in Appendix-B providing the horse meets the PRE Fusion Horse characteristics, showing PRE-Type or Partbred PRE-Type in the 4 photographs taken at the time of the veterinary ID for Registration. Above Right: This beautiful mare, Zulema, is a good example of the high-quality PRE-type horses of unknown parentage which are registered in Appendix-B. NOTE: If the horse has an ID-Only Passport (considered by EU to be a Meat-production Passport) it is essential under the new EU Zootechnic legislation that the ID-Only Passport is cancelled via BAPSH Ltd and replaced by a BAPSH Studbook Registered Horse Passport at the time of registration which converts the horse to ‘Purebreed’ status even when the back history is not known. APPLICATION FORM for BAPSH Ltd RE-ISSUE PASSPORT to Upgrade Horse to PEDIGREE REGISTERED STATUS. 2) The PRE Fusion Sire is Approved for Breeding. 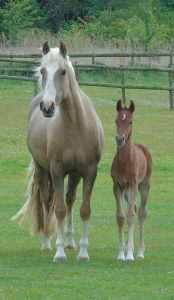 3) The Appendix-A horse has a full DNA Type and Parentage compatibility test completed and the Certificate sent to the BAPSH (in cases where the Covering Certificate/foal at Foot criteria were not met with). 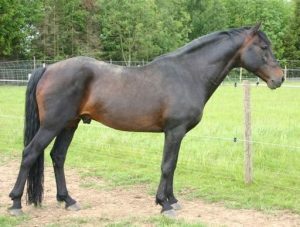 5) The 75% PRE product of a 50% PRE daughter of a non-pedigree mare (either Section1 Appendix-B or another breed-type) will be upgraded to the Main Studbook. ii) The standard foal registration requirements have been followed. Two Approved for Breeding PRE Fusion Stallions. Left: Espiritu – 50% PRE (Churumbel II) & 25% TB/ 25% Andalusian. Bred/owned by Karen Collison, Aztec Stud, UK. Right: Legendario – 50 % PRE (Bronco XVIII)&50% Andalusian. Bred by Jacinto Gonzalez Perez, Spain. Owned by Amy Long. PRE Fusion Stallions must be registered with BAPSH Ltd in the Main Studbook, DNA typed and Parentage confirmed, and tested negative for the relevant genetic diseases. They must be over 3 yrs old and have been assessed by the Breeding Evaluation Team and awarded 5/10 or higher, (see paragraph on Breeding Evaluation below for details). PRE Fusion Mares may also be presented for assessment in the same manner as the Stallions; breeders and owners are recommended to undertake the assessment which provides valuable information for the breed and breeding programmes. At present there is no barr upon breeding from PRE Fusion mares which have not been assessed. All PRE sires or dams must be Approved for Breeding at the Basic level by the ANCCE-LGPRE..
Below Left: Saragossa lying-down with her delightful filly, Chiquita, at 2 wks old. 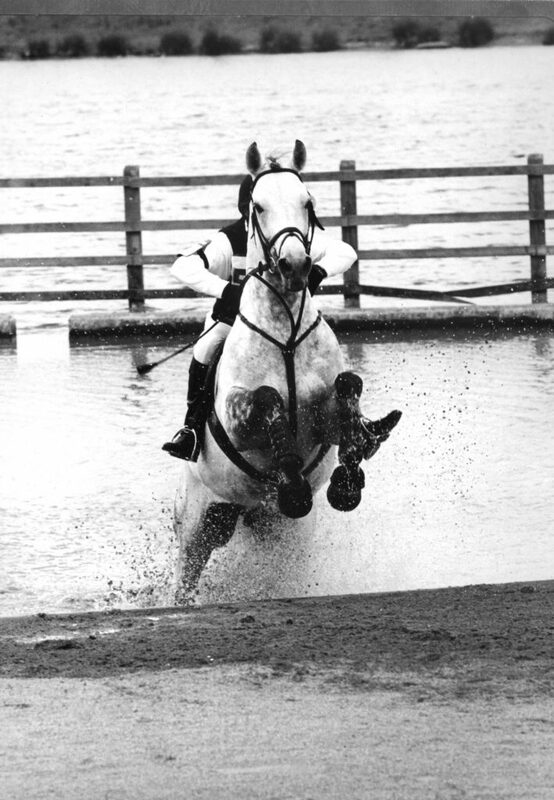 Saragossa (82.5% PRE) was born in 1983, amongst the earliest to be registered in BAPSH Ltd Register II Studbook. Embryo Transfer is permitted using any healthy Mare of good size and good temperament as the host/s. PRE Fusion Mares may have more than one foal registered from them each year via the use of host mares. 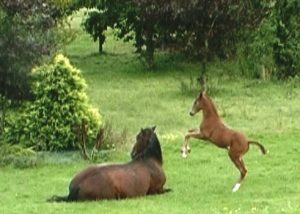 All Mares must be over 3 yrs old before being put in foal. Covering Certificates for PRE Stallions and PRE Fusion Stallions can be obtained from the BAPSH Registry Office. Covering Certificates for other purebreed Stallions must be obtained from the relevant Studbook with which that stallion is registered. Breeder/Owner downloads the BAPSH Ltd Register II Section 1 Foal Registration Form or requests a copy from the BAPSH Ltd Registry Office. 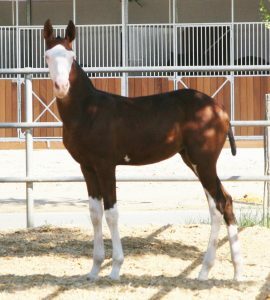 The Foal Registration form and DNA sample are sent to BAPSH Ltd with copies of the Parents Registration documents with 4 generation pedigree, Genetic Health Test Results (if available) for Quarter Horse, American Paint Horse, Appaloosa, Friesian, Warlander, Albion Azteca, or Spanish Spotted Saddle Horse parent/s, & copies of parents’ passports, and the Mare Owner’s Section of the Covering Certificate, plus the appropriate fee to include the fees for the following DNA tests where required – see below. b) The test for PSSM is done if the QH/APH/Appaloosa/Friesian lineage parent or parents is/are NOT certified Negative for this genetic disease. c) The tests for Hydrocephalus & Dwarfism are done if the Friesian or Warlander lineage parent or parents is/are NOT certified Negative for these genetic disease. 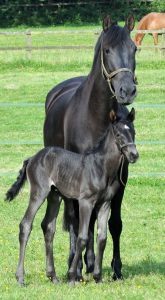 Stallions – Breeding Evaluation is compulsory for Stallions over 3yrs old registered in the PRE Fusion Horse Main Studbook before they may be used to cover mares. Below Left: Mistrals Summer Treasurer -50% PRE (Rocky L Claudius x Welsh/Arab/Lusitano) – a beautifully turned out example of handler and horse in harmony. This is what to aim for when you’ trot out’ in-hand for the Breeding Evaluation. 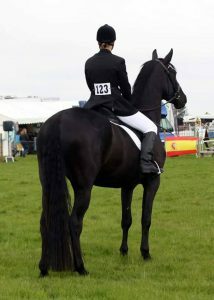 Bred & Owned by Helena Berrisford. Performance Awards for Competitive Sport. Horses that compete in Dressage, Show Jumping, Eventing, Driving, and Endurance at the higher Affiliated levels can gain points for achieving specific scores or %. The number of points required to achieve the ‘Sport’ designation is dependent upon the Sport; points must be achieved across a minimum of 5 shows/competitions in a 12 month period. The Owner of the horse must submit documentation to the BAPSH at the end of the 12 month period to prove the achievements. The horse is then awarded the title of Sport-Drs, Sport-SJ, Sport-Ev, Sport-En, or Sport Drv, or any combination of these titles. 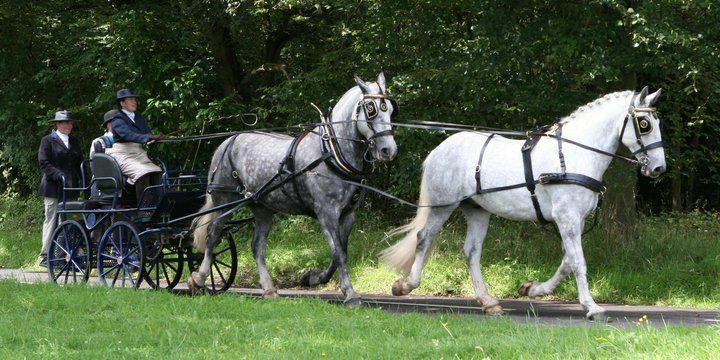 This information is added to the horse’s online web information and pedigree which should be live online by early March 2019. Brecknock Deacon & Brecknock Mercury – half-brothers sired Bodeguero X (PRE stallion) ex two Purebred Shire Horse mares. 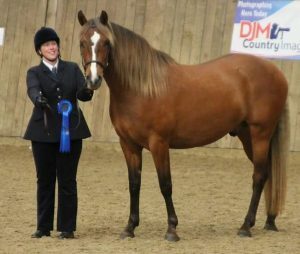 These geldings competed extensively at a National level with their Breeder/Owner/Driver Vicky Irwin. Left: Aztec Principe Dante -75% PRE (Donado x Aztecs Shoshana) – beautifully turned out example of the PRE Fusion Horse. Owner: Debbie Townsend. 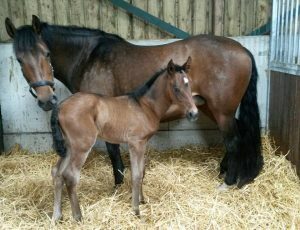 Bred by Karen Collison. 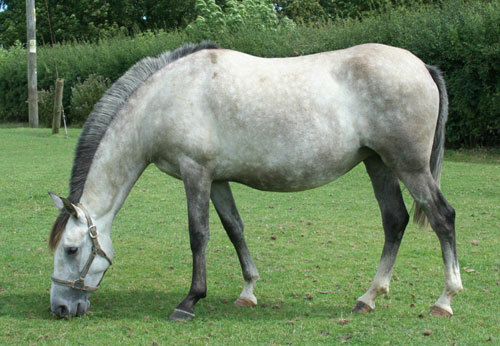 Centre: Parccarreg Maddy – 25% PRE (Naldo- Há x Welsh/Arab mare) Bred by Julie Williams, Owned & competed by Jane Jones. 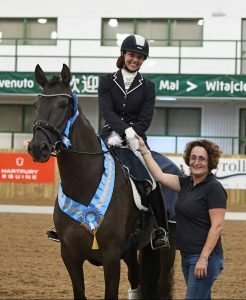 Right: Palomares D’Oro – beautiful PRE-Type Appendix-B horse ridden and competed side-saddle & dressage by owner Michelle Enoch. Above: Kitalpha – 8yr old gelding 25% PRE & 50% Welsh Cob. 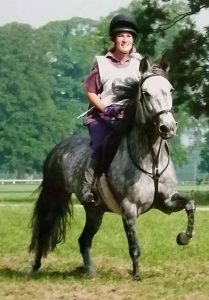 Competeing at Windsor Park Regional Driving Trials June 2017 for Owner/Breeder Sally Bullar (Kerr). retrospectively, Sports points achieved in previous years before this Performance Award Scheme was initiated will be considered on a horse by horse basis providing the documentation provided is solid. Right: Mariessa – 3rd generation of PRE Fusion breeding from Sue Disney’s Willowdell Stud mare line. Owned/Competed at National level Endurance by Claire Quinney. Mariessa is the dam of Beeches Alberto featured at the top of this page.